David C Dauch, chairman and CEO of American Axle & Manufacturing (AAM). 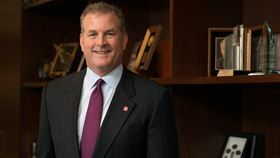 David C Dauch, chairman and CEO of American Axle & Manufacturing (AAM), has received an entrepreneur of the year award for the Michigan and Northwest Ohio, USA, region. The award recognizes entrepreneurs who excel in innovation, financial performance and personal commitment to their businesses and communities. Software company Altair and the US-based Center for Automotive Research (CAR) have announced the winners of the 5th annual Altair Enlighten Award.